At the crossroads of Tribeca and Soho is the uniquely upscale One York Street, a new construction boutique condominium with much more than just a prime address. This meticulously-designed 2-bedroom, 2 bath apartment in convenient north Tribeca also offers distinctive modern living space, plus great value as well. 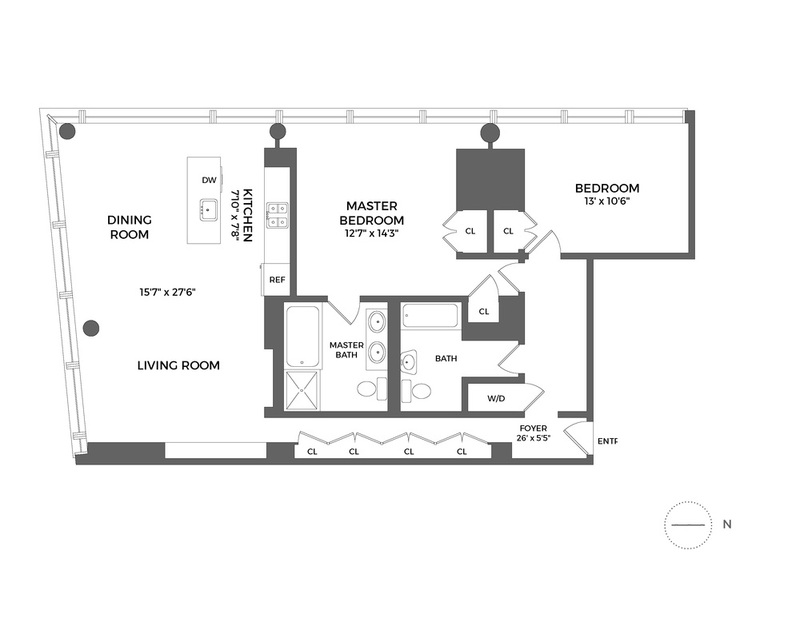 Downtown chic-seekers will feel right at home with a 1,383sf layout that’s stylish, cool and comfortable. Generously-sized rooms with floor to ceiling windows are complemented by timeless finishes like Mafi Austrian wide plank oak flooring, 8′ high painted solid wood doors, Omni brushed stainless steel hardware, Valcucine Vitrum full gloss kitchen cabinetry, Miele, Sub Zero and Bosch appliances, and Calacutta Gold marble master bath flooring. Designed by renowned architect Enrique Norten, One York Street is an intimate 33-unit building with unbeatable amenities like a full-time doorman, 24-hour onsite concierge, full-time resident manager and porter, fully-automated Swiss-engineered parking garage (the first of its kind in NYC), 28′ outdoor heated swimming pool, 2,200 square foot sundeck with outdoor shower, private health club, central air conditioning, and individual storage. Located at Laight Street and 6th Avenue, just south of Canal Street, with easy access to transportation, PS 234 and other area attractions.